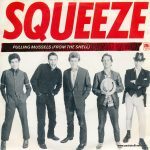 On 2 May 1980 [[Pulling Mussels (From the Shell)]] was released as a single in the UK. It was the second single from the Argy Bargy album. It reached number 44 in the charts.